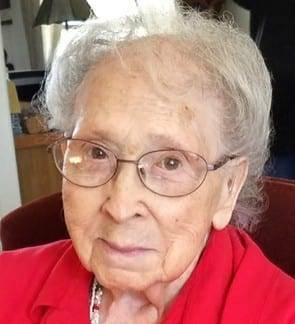 Enid P. Friess, age 97, of Wauseon, passed away at Toledo Hospital surrounded by her loving family Saturday afternoon, February 9, 2019. Enid was born in Swanton on November 29, 1921 to the late Glen Olney and Lora (Koder) Olney. She was a graduate of Eaton Rapids High School in Michigan. On October 19, 1940 she was united in marriage to William Friess and he preceded her in death. Before retiring, Enid worked at Fulton Manufacturing. She is survived by her children, Gary (Janice) Friess of Delta, Janet (Daniel) Martinez of Paulding and Terry (Joan) Friess of Napoleon; sisters, Lauralee (Lenny) Sanders and Judy Hall; 8 grandchildren; 21 great grandchildren and 13 great great grandchildren. Along with her husband, William, she was preceded in death by her brothers, Bill, Raymond, Glen, Tom, Jack and Jim Olney; sisters, Ruby Ekins, Arla Jean Phillips and infant Helen Olney; along with grandson, Troy Friess. Friends will be received from 2:00 PM – 8:00 PM on Wednesday, February 13, 2019 at Barnes Funeral Chapel, 5825 St Hwy 109 in Delta. A funeral service celebrating Enid’s life will be held at 10:00 AM on Thursday, February 14, 2019 at the Delta United Methodist Church, 101 Northwood Dr, Delta, Ohio 43515 with a luncheon to follow. Interment will be held at 2:00 PM on Thursday at Toledo Memorial Park. Memorial contributions may be directed to the Delta United Methodist Church or to a cancer research organization of the donor’s choice in her name. Be the first to comment on "Enid Friess (1921-2019)"